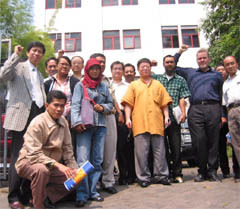 Christopher Warren (second from right), president of the IFJ, and delegates from Korea, Taiwan and Indonesia, pose in front of the Indonesian Tempo magazine building in Jakarta, Indonesia, on Aug. 7, 2004. The Journalists Association of Korea (JAK), the largest group of working journalists in Korea, urged the Indonesian government Aug. 16, 2004, to remove defamation as an offence under the criminal code. The IFJ also called on the Indonesian government to introduce legislation requiring an appropriate and rational amount of damages to the relevant harm in civil defamation cases. It called for the Indonesian government's removal of the crime of "insulting the President and vice president" from the statute books. The JAK also asked the Indonesian government to do all that is necessary to ensure that the media in Indonesia operates in a climate of healthy and robust press freedom. "In line with the International Federation of Journalists' campaign, we are sending today a letter of protest to the Indonesian government through its embassy in Korea," said Lee Sang-ki, president of the JAK. "It is in the interests of genuine freedom of the press in Indonesia and we call on the Indonesian government to repeal these regressive laws." The IFJ, the global organization representing over 500,000 journalists in more than 100 countries, recently asked its member associations, including the JAK, to appeal to the Indonesian government by sending a letter of protest Aug. 16 when three Indonesian journalists, Bambang Harymurti, T. Iskandar Ali and Ahmad Taufik, were supposed to appear in a Jakarta court to defend themselves against a defamation action brought by businessman Tomy Winata over an article published in Tempo magazine on March 3-9, 2003. 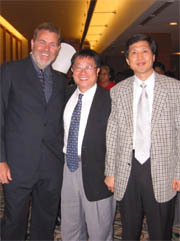 Christopher Warren (first from left), president of the International Federation of Journalists, poses with Lee Sang-ki (center), president of the Journalists Association of Korea, and Kang Seok-jae, chairman of the International Affairs Committee of the JAK, during a reception held on Aug. 7, 2004, at a hotel in Jakarta, Indonesia, to celebrate the 10th anniversary of the founding of the Alliance of Independent Journalists. The article aired allegations that Winata stood to benefit from a fire in a textile market in Jakarta. The journalists could face up to four years in jail each if they found guilty. Ahmad Taufik, a founding member of the Alliance of Independent Journalists in Indonesia, was jailed under the criminal code during an attempt by the Soeharto regime to clamp down on press freedom. In 1995, he was jailed for three years for reportedly "hate-sowing articles." In 1997, he was awarded the 1995 CPJ International Press Freedom Award. He could not accept the award in 1995 because he was serving out his three-year sentence in jail. Over the past year, there have been a number of defamation cases brought against journalists and media organizations in Indonesia. "Indonesia must act immediately to reform its draconian defamation laws: defamation should be dealt with under the Indonesian Press Law, not under Indonesia's criminal code," the IFJ urged. JAK President Lee and Kang Seok-jae, chairman of the International Affairs Committee of the JAK, visited Indonesia Aug. 6-9 to attend the 10th anniversary of the Alliance of Independent Journalists in Indonesia. While in Jakarta, the Korean delegation visited the Tempo office along with other delegates to hear from its officials about the defamation case.